Grab your DK Bongos and let the rhythm move you! Clap your hands and drum to the beat in over thirty songs, from kids' medleys to classical remixes and pop favorites. Donkey Konga puts the music in your hands! -Hit the beats perfectly to drum up high scores and clear all the songs! -Drum along with your friends in frantic four-player jam sessions! -Take five with fun-filled minigames like Banana Juggling and the 100M Vine Climb! 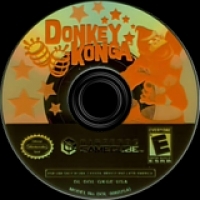 -With favorite hits from every genre, Donkey Konga's got something for everyone! 01-20-2016 aliensstudios Box Text Jungle Boogie! Grab your DK Bongos and let the rhythm move you! Clap your hands and drum to the beat in over thirty songs, from kids' medleys to classical remixes and pop favorites. 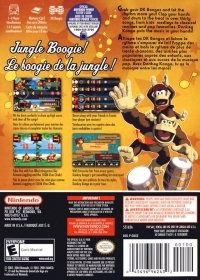 Donkey Konga puts the music in your hands! -Hit the beats perfectly to drum up high scores and clear all the songs! -Drum along with your friends in frantic four-player jam sessions! -Take five with fun-filled minigames like Banana Juggling and the 100M Vine Climb! 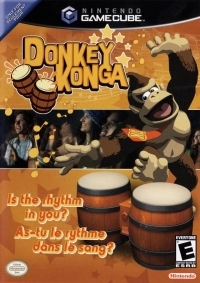 -With favorite hits from every genre, Donkey Konga's got something for everyone! This is a list of VGCollect users who have Donkey Konga in their Collection. This is a list of VGCollect users who have Donkey Konga in their Sell List. This is a list of VGCollect users who have Donkey Konga in their Wish List.